One of the main goals of the Culturelink Network is to serve as a resource centre for all of its members, more than a thousand national and international cultural networks and institutions, academic bodies, public and private agencies, decision makers and artists in over one hundred countries on all the continents, compiling and disseminating information on new concepts, research challenges, trends, experiences and practice in the field of cultural development, cultural policies and life. With their active contributions to cultural development policy and cooperation, the members enrich the Network, especially thanks to the use of modern information technology. In line with its declared goals, the Network's long-term objective is the development of a world-wide information system for the study of cultural policy, cultural management and development strategies, and the establishment of international cultural cooperation projects which will strengthen the dissemination of cultural information and promote new partnerships and cooperation on international, national, regional and local levels. The Culturelink Network has been accessible via the Internet's Gopher service since 1994, while the Culturelink Home Page was first set up on the World Wide Web in 1996. Ever since its establishment, the Culturelink Web site has been constantly evolving. It has been updated and expanded regularly, growing into a complex WWW Resource Centre. Out of the simple five-page home page of Culturelink set up in 1996, offering only the most basic information, the structure evolved as items were added one by one, and in time a full-scale information service was developed through the WWW project, with the site now counting around 500 pages with thousands of information entities. Culturelink electronic publications (Culturelink WWW Resource Centre, Culturelink CD-ROM). Although most of the Culturelink information services were originally established before the dawn of the Internet, they were all successfully transferred to this new medium. Serving its members on a daily basis, the Culturelink Network now disseminates its information both on paper and by electronic means. 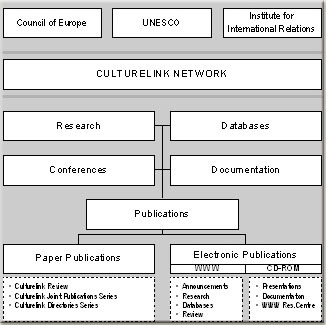 Besides taking advantage of the Internet's World Wide Web to enrich its multiple information services, in the past two years the Culturelink Network has also been promoted systematically via a CD-ROM edition, presenting its activities in general and its databases on the Internet in more detail, and carrying the most recent revision of its WWW Resource Centre. Developed as integral part of the Culturelink Information System, the static and dynamic content of the Culturelink WWW Resource Centre offers access to information and news about the Culturelink Network, its current and past research activities, the Culturelink database system consisting of the Cultural Policy Database, the Cultural Development Database and the Cultural Resources Database, the Network's various publications, including the Culturelink review and the Culturelink Directory Series, and announcements of current international events, meetings and conferences world-wide. Aiming to offer its regular readers and occasional visitors simple access to all information, the WWW content is laid out according to a clearly predefined structure. All electronic content is produced as a result of Culturelink project activities, in response to user interests and needs. The WWW Resource Centre presents information from a number of sources, primarily from the paper edition of the Culturelink review (itself produced from input received from UNESCO, the Council of Europe, international organizations, government agencies, research institutions and individual experts), from Culturelink database projects and from network members themselves. The Culturelink Home Page (http://www.culturelink.hr) is located at the WWW server of the Institute for International Relations (IMO), Zagreb, and is connected to the Internet via the Croatian Academic Research Network (CARNet). Aiming to accommodate a constantly growing number of visitors from 100 countries (and 107 domains) world-wide, several Mirror Sites have been set up through Culturelink’s World Wide Web Project in 1998 to improve the accessibility of its Web content, allowing for faster access to the information from all parts of the world. Published regularly as a selection from the printed edition, the fully searchable electronic edition of the Culturelink review covers Networking in Progress, Research and Programmes, UNESCO, the Council of Europe and the European Union, International Meetings and Conferences, and the Dossier. Announcements of current events from the paper edition are regularly enriched with up-to-the-minute additional information in the electronic format of the review, which is frequently available online even before the paper edition reaches its readers. Currently announced events are listed by title, venue and date in yearly chronological indices, while past events are moved to an archive and preserved for reference purposes. The Cultural Policy Database is a textual database developed as an integral part of the long-term IMO project entitled Current State and Trends in Cultural Policy and Life in UNESCO Member States, which includes bibliographical and referral data on the direction of cultural policies, administrative and institutional structures, financing and legislation, cultural industries, etc. Since 1995, the Cultural Policy Database has been reachable through the Internet at IMO's Gopher site, and since 1997 updated data on part of the European countries and Canada is accessible through the World Wide Web at Culturelink's Home Page. To facilitate context-sensitive navigation through the thematically uniformly structured data, as well as the interactive comparative study and analysis of the country profiles with their specific concepts, trends, experiences and practices in the field of cultural policies, a Comparative Study Menu allows the selection of a country and topic of interest, giving researchers and scholars working in the field of culture, as well as policy makers and those engaged in cultural action and advocacy world-wide, the opportunity to identify existing resources and locate priority problems in different geo-cultural areas and at different levels of economic development. The Database of Networks and Institutions in the Field of Cultural Development (called the Cultural Development Database) has been established to facilitate information exchange among the Network's members as well as the exchange of scholars and cultural workers involved in the field of cultural development. It contains general data and contact information about more than 1000 institutions and networks, and more detailed information on some 300 selected institutions and networks from all regions of the world, describing their information infrastructure and databases, their research projects, publications, artistic activities, international cultural cooperation, etc. Fully operational since 1993 as a local database, it is experimentally accessible online via the Culturelink WWW Resource Centre since 1996, currently allowing simple searches by country, field of interest and keyword. The continually expanded and updated collection of World-Wide Cultural Resources represents a rich, structured collection of links to 300 selected related sites, covering intergovernmental organizations, national institutions, research institutions, arts organizations, publications and resources relevant to the fields of cultural policy, development and management. During the past year, four new issues of the Culturelink review have been prepared for WWW publication, updated cultural policies were made available, the freely accessible data of the Culturelink Database was further developed and updated, and the number of links to related sites was doubled. In addition, the project for the advancement of the Culturelink WWW Resource Centre has been launched. Following its previously mapped strategic WWW development plan, the third revision of Culturelink's Internet-based information services has now been prepared, aiming to unify its design and simplify its use. The project of upgrading the functionality and accessibility of the Culturelink WWW Resource Centre was set up in a user-friendly manner, especially taking into account its users' needs and their level of technical equipment. In order to improve the clarity and usability of its information resources, Culturelink has graphically redesigned its WWW Resource Centre and restructured the content layout. Advanced navigation and content retrieval mechanisms have been set up, based on menu bars and a search engine. The Web presentation has received a more graphical and user-friendly design, though it remains largely text-based to accommodate less technically equipped users with slower connection speeds. A separate page has been set up for brief news and information, and specific content archives, such as the past issues of the Culturelink review, are now easily accessible via a drop-down menu. Currently announced international meetings and conferences are listed in yearly chronological indices, while past events remain available in an archive. To satisfy the growing interest of the Culturelink members and visitors, a search mechanism has been set up to facilitate content retrieval by searching for specific words or expressions either over the entire site or only through the pages of certain grouped information sections. Users currently generate well over 500 search requests per month. The basic search mechanism, available from the top of each page, covers all documents of the overall site, while the advanced search form allows the specification of certain search criteria, including word or phrase matching, document dating, and the selection of specific data collections which cover the Culturelink review, the Cultural Policy Database, and the Diary of International Meetings and Conferences. To give insight into the site structure and speed up navigation to a specific section of interest, the site map offers a linked overview of the content structure of the entire site. An improved accessibility of Culturelink's WWW resource information has been achieved through a clearer content layout and the use of easily accessible navigation bars, as well as through a newly created collection of service help pages. The WWW Resource Centre's support pages offer user help to its visitors, providing free auxiliary tools, basic and advanced navigation and content retrieval mechanisms, and service information which includes Culturelink Web development credits and legal information such as copyright notice, disclaimer and privacy statement. In addition to its regular content development activities, the Network is currently developing and planing several projects concerning the further advancement of its information services. With the constant growth of the Cultural Development Database, over the years it has become increasingly difficult to collect the data and keep it up-to-date. As the database aims to provide a mechanism for seeking, as well as for offering information needed for the establishment of cultural cooperation, Culturelink plans the development of an interactive version of the database to facilitate the online input and updating of information by the users themselves. The project also foresees the possibility of multiple-criteria searches and the integration of the Cultural Development and the Cultural Policy databases in order to provide a more complete picture of the cultural resources in different countries. In an attempt to provide its members and partners, as well as other cultural professionals, with more efficient ways of cooperation, Culturelink will produce a Guide to the Culturelink Network, aimed at cultural researchers, policy makers or administrators, cultural workers, artists or students interested in cultural and artistic development, management and education. To be made easily accessible via the Culturelink WWW Resource Centre, the Guide will publish up-to-date information about Culturelink members and collaborators, listing their contact details, including e-mail and web addresses, and giving a brief description of each member institutions' role and the services offered. As statistical access data of the Culturelink WWW Resource Centre shows a significant interest of its visitors in the related sites listing, the development of a WWW portal project is envisaged in cooperation with the International Federation for Information and Documentation (FID) and the Budapest University of Technology and Economics (TUB), based on the development plans of UNESCO's cultural policies programme. A WWW portal giving policy- and decision-makers in the field of culture, as well as cultural workers involved in research, training and operational activities access to evaluated, thematically and regionally structured quality content, mapping relevant cultural resources provided on-line by different levels of government as well as by the non-governmental, private and 'third' sectors, is a logical complement to Culturelink's existing information system. Using Culturelink's existing infrastructure and being based on Culturelink's hand-picked collection of pointers to related institutions and information in the field of culture, the WWW portal will represent a significant step forward in advancing the usability and accessibility of cultural information world-wide. In its evolution from the first WWW implementation, through management and further content development phases, the Culturelink Information Services are now reaching an integration stage. Culturelink's envisaged integral information system echoes UNESCO's plans to reinforce its new cultural policy for development programme through broadened information services, guiding users to relevant institutions and networks active in the field of culture. In addition to linking Culturelink's databases, it is planned to research the Internet presence of institutions relevant to cultural policies, and to include and continuously update pointers to them in the cultural policy database. Since the establishment of Culturelink's Internet presence, the number of regular users and visitors to its WWW resource centre has grown steadily, with many of them contacting the Network to express their satisfaction with the services offered and the usefulness of the information provided for their daily work. 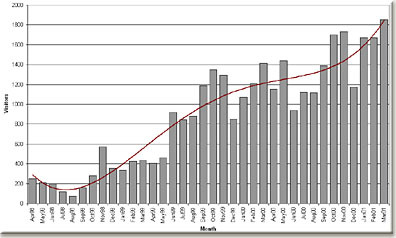 Some 2,000 visitors a month currently generate up to 10,000 page views, and the trend line very clearly indicates the constant average growth. The WWW Centre usage statistics show a clear interest of its visitors in up-to-date information sources on current events (publications and conference announcements) and cooperation contacts (databases). The frequency of linking to the Culturelink Network WWW Resource Centre from other pages on the Internet ranks our services well within the top 10% of the most linked sites out of the over one million sites monitored at WebsMostLinked.com. As a curiosity, the domain www.unesco.org is ranked only as number 667362 out of the 1151487 domains in this database, placing it just below the 50% mark. A more detailed overview and in-depth analysis of the Culturelink WWW access statistics, including the number of users and content usage patterns is planned for a future issue of the Culturelink review. As ever, Culturelink encourages cooperation in all of its listed current and planned activities. Linked through the Network and its WWW Resource Centre, national and international institutions, academic bodies, public and private agencies, third sector bodies and foundations, individual experts, decision makers and artists in all regions of the world are invited to work together on the promotion of cultural diversity, policies and practices to foster creativity, encourage participation in and guarantee access to cultural activities, and stimulate the awareness of the strategic importance of considering the cultural dimension of development. To include an announcement of your planned events in Culturelink's Diary, please send a brief description with contact information to Culturelink@irmo.hr. Take advantage of the global reach of the Network's culture links – inform the world about your activities. Via the Internet, news about the work conducted by the Culturelink Network itself and its members, as well as announcements of other events in the field of cultural development are freely accessible from around the world at any given moment. The Network benefits from modern technology to facilitate communication between its members and speed up the flow of relevant information on cultural development and cultural policies. Through its Internet activities, the Culturelink Network hopes to strengthen research networks and capacities by sharing the available data more equitably world-wide, forging new tools, innovative approaches and alternative alliances at local, national, regional and international levels. Optimized for Microsoft Internet Explorer 5.0 and above. Best viewed in 800x600 resolution mode.